At first, all they knew was that the problem had something to do with water, but at the end of the eight-hour competition it was problem solved. A team of engineering students from the University of British Columbia’s Okanagan campus took first place at the Western Engineering Competition 2012 in Calgary recently when faced with the best way to clean up an oil spill. 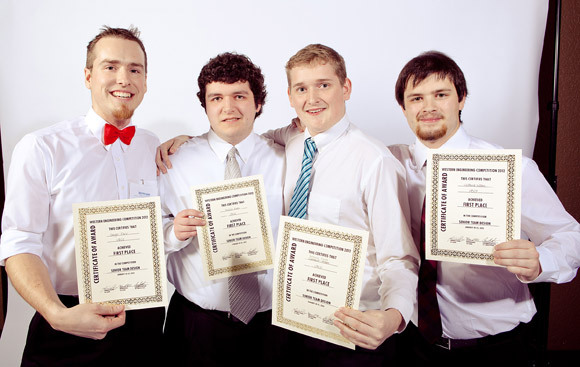 The team of Clifford Gilker, Devyn Farr, Patrick Finch and Philip Batt took first place in the Senior Design category – the top event at the competition. The team was faced with a simulated oil spill to deal with and they had eight hours to come up with a budget for the material they would need, a presentation on their plan and a method for removing the ‘oil’ from water’s surface. The oil was actually wood pellets and by the closing bell, the Okanagan team had scooped up more simulated oil than their competitors. “It was extremely stressful. There were four of us in a little eight-foot by eight-foot cubicle for eight hours,” says Farr, who is studying to be an electrical engineer. Gilker, who is studying to become a mechanical engineer, said they learned the importance of time management and working together. “It was a real-world experience compressed in to a single day,” says Farr. Being such a new institution, some competitors overlooked UBC's Okanagan team. “I don’t think some people took us as seriously as they should have, so it was kind of nice to come out on top,” says Finch who was also the team captain. The Okanagan team defeated some of the best minds from Western Canadian post-secondary institutions, but all smiled a little more when asked how it felt to defeat the UBC team from Vancouver. They will now head to the national competition at UBC's Vancouvercampus March 8 – 11. Farr says they are “excited and terrified” to be going to the national event, but they are also ready to take on all comers. The event will mark the first time the engineers have competed at the national level. The WEC and nationals are highly regarded and bring out representatives from some of the biggest companies in the world, all wanting to see the rising stars of the engineering world. The Okanagan campus sent 17 students to the WEC event, forming four teams to compete in a variety of events. Natasha Orlitzky, civil engineering student and vice-president of external relations for the Engineering Undergraduate Society, says the Okanagan team received an honourable mention for the Spirit Award. “That’s really big, especially for a new school,” says Orlitzky.